The Romans were by nature practical people -- simple farmers raising crops to sell or eat. Isolated from the rest of the world because they lacked a port, the Romans used their unique character to build a great culture. What was it is that made them aspire to greatness when their neighbors were happy in a tribal existence? There is no doubt they were driven by a passion for organization and a spirit determined to move forward and make life more efficient. Romans were not idealistic. They admired the Greeks, but didn’t want to be like them. They looked at philosophy with disdain because it had no practical value, and were also practical about religion. They started, as all early peoples, with the belief that gods live in nature and animal form. Later they came under the influence of the Etruscans who controlled them for a couple of centuries. The Etruscan list of gods was extensive, and the Romans borrowed it almost completely. In one important respect, however, the Romans did not borrow from the Etruscans. They would not accept the concept of predestination and its consequent fatalism. The Etruscans employed a book of fates, called the Libri Rituales which was divided into three parts: Fatales which predicted the lifespan of peoples and individuals, Acherontici which described the rituals needed for salvation, and Ostentaria which gave rules for the interpretation of portents and omens. In the Fatales the Etruscans predicted the demise of their own culture. They defined an interval of time called a saecula which spanned about eighty years. According to their tradition, the Etruscan people were allocated ten saecula by the gods, and when the endpoint was reached the Etruscan civilization would come to an end. Each year at a festival the Etruscan priests would note the number of years they had left. This fatalism was too depressing for the Romans who adopted the Ostentaria and discarded the rest. As the Romans moved away from the Etruscans, they carried on their adoption of gods. Following the military victory over the Latins at Lake Regullus in 496 B.C, they brought home the Latin gods Castor and Pollux and built temple to them in the Forum. 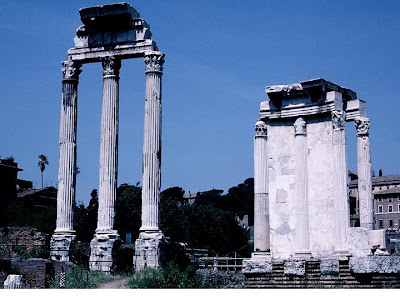 Below is a picture of the remains of the Temple of Castor & Pollux standing behind the ruins of the Temple of Vesta. The Roman Kings had been political and religious leaders, but under the Republic, the new position of religious leader, the Pontifex Maximus, was separated from the offices of government. The Pontifex was responsible for divining the wishes of the gods and making sure those wishes were satisfied. His staff included Haruspices, Flamines, and Vestels. The Haruspices were responsible for the interpretation of signs from nature, the Flamines caretakers to the state supported gods, and the Vestals were responsible for keeping the eternal flame lit in the Temple of Vesta. This odd view of authoritative religion separated the people from the beliefs of the state, leaving only family worship to be practiced by the people. As time went on during the period of the Republic, the Greek and Roman gods began to merge. The educated Romans had become tired of their old religious forms and were looking for something new. Although a combined Roman-Greek mythology would open the door for religious skepticism, it provided a pathway to Greek Philosophy which eventually became interesting to the upper classes. The Plebs never gave up their historical connection to the old religion. History can teach us about the present. Are we progressing or regressing? To learn about/buy The Progressive Gene click here. Share book reviews and ratings with Mike, and even join a book club on Goodreads. Ok biography. More fun to read Caesar directly. Great way to get to know the emperors. The first great history of Rome. The style is readable and the stories interesting. The title banner for this blog was designed by Shelly Anderson. Copyright 2011 Michael C. Anderson. Awesome Inc. theme. Powered by Blogger.